What, potatoes? Yes, potatoes. You can substitute sweet potatoes if you want. 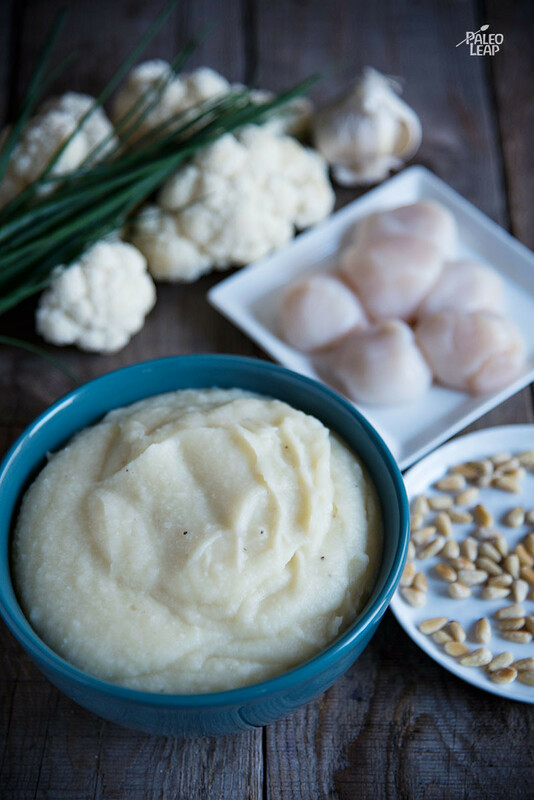 This recipe is simple but elegant: fresh scallops seared in a rosemary-garlic olive oil, on a bed of pureed vegetables and topped with more fresh herbs and pine nuts. 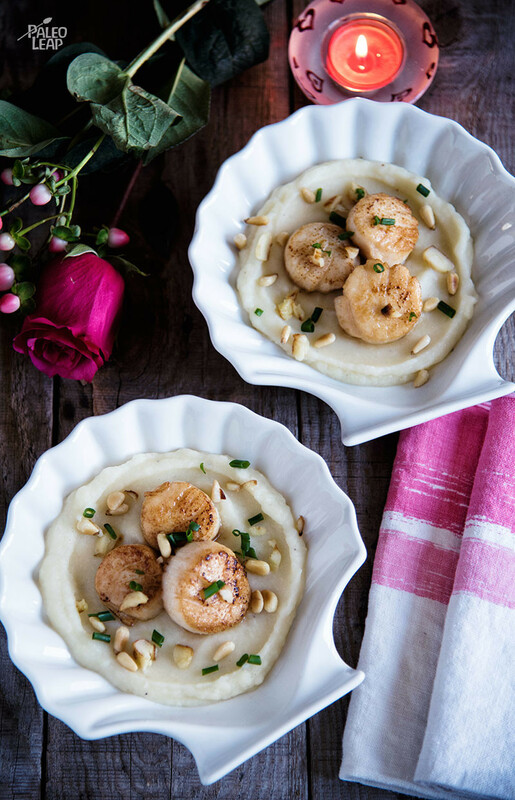 The scallops add a big nutritional punch to the recipe: they’re full of iron and vitamin B12, and they’re a great source of selenium, which is important for gut and thyroid health. The one thing they don’t really give you is Omega-3 fat: the fat from fish is rich in Omega-3s, but scallops are so lean that they just don’t have enough fat to deliver any significant amount. If you’re looking for a light dinner, this would be just the thing. Serve it as it is, or round it out with a side salad to add some color to the meal (spinach, walnuts, and cranberries would be good here). Place the cubed potatoes, cauliflower, and vegetable stock in a saucepan. Bring to a boil over medium-high. Lower heat to medium and let simmer until the vegetables are soft. Season to taste and purée with an immersion blender until smooth. Keep warm. This will be your mash. Add the garlic and fresh rosemary and stir for about 1 minute. Sear the scallops 1 to 2 minutes per side, basting with the garlic and rosemary-infused oil. Season the scallops to taste. Serve the purée on small plates. Top each plate with scallops, pine nuts, and fresh chives.